Global E-Commerce and the Web. Global, Regional, International, and Local. Global Standards. Globalized Data and Transactions. Globalization Process and Techniques. Transaction Engineering. Enterprise Application Integration. The Complexities of Mobile E-Commerce. Appendix. "This book is a boon to technology professionals who are responsible for global integration projects. Faced with the mind-boggling complexities of standardizing global data, global processes and global e-commerce, even the most experienced professionals are often at a loss. James Bean has created an extraordinary compilation of standards information, and provided his insight on how to resolve complex integration problems. This book will benefit IT community at large, and I would encourage both specialists and novices alike to bring this book into their personal libraries." -- Arka Mukherjee, Ph.D., CEO, Global IDs Inc.
A practitioner's guide to developing global e-commerce sites, focusing on the design and engineering of Web forms for global data collection and alignment with widely recognized international standards, XML structures, and XML vocabularies. 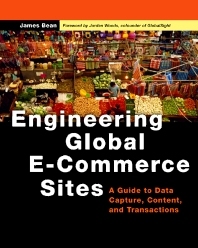 The author describes the globalization problem, identifies common design errors, provides a representative scenario, and introduces effective solutions and techniques. James Bean is the President and CEO of the Relational Logistics Group. He is the author of the books: the "Sybase Client/Server EXplorer" © 1996 Coriolis Group Books and "XML Globalization and Best Practices" © 2001, and has written numerous magazine articles for technology journals. He is also the Chairman of the Global Web Architecture Group. CEO, Relational Logistics Group, Phoenix, Arizona, U.S.A.